ComeOn! is a relatively new sportsbook, having being set up in 2010. The name itself is probably one of the coolest sportsbook names and one of the few companies it seems who had some initiative to move away from the safer option of putting the word “bet” in their brand name! ComeOn! have seen huge growth in the UK market since then which is ridiculously competitive and in 2016, they were acquired by Swedish Online Casino kingpins Cherry AB. Cherry AB reportedly spent €280 million on the acquisition, which is an amazing amount considering the company was only in existence 6 years. Cherry AB has now assumed ComeOn!’s brand name and are expecting large growth in the UK and Irish markets but also in their home Scandinavian markets where the use of ComeOn!s innovative name, company ethos and product offerings will be a driver of renewed growth there. The main positives we see with ComeOn! compared to their more experienced competitors is the ease of use of the website along with the lack of clutter on their website which allows for the everyday punter to get their bets on without any fuss and they also have one of the best player rewards schemes currently on the market. To be honest, we do not understand why more sportsbooks do not offer a loyalty points system. It worked in the online poker industry and surely is a no-brainer for the sports betting industry too. The one major gripe with ComeOn! is the lack of telephone support, but considering most people in this day and age prefer using messaging services like WhatsApp and Skype, they are used to just dealing with live chat and email type support. The following review will cover all the positive and negative aspects of ComeOn! sportsbook and give it a final rating. Currently ComeOn! offer a triple welcome offer. £10 Free Bet T&Cs: 1. New UK customers only. 2. You must opt-in to the £10 Free Bet promotion upon registration. 3. Minimum £10 deposit and qualifying bet required at minimum odds of 1.8 in any sportsbook market, within 14 days of opening account. Each way bets do not qualify for this offer. 4. Min. deposit of £10 required 5. You will receive your £10 Free Bet Token within 24 hours of your qualifying bet being accepted. 6. You cannot use this promotion in conjunction with any other Welcome Offer. This £10 Free Bet does not exclude you from taking the Casino £25 Deposit Bonus at a later date. £25 Deposit Bonus T&Cs: 1. New UK customers only. 2. You must opt-in to receive a 100% matched first deposit bonus, up to £25. 3. Minimum £10 deposit required. 4. Max bonus is £25. 5. Minimum wagering requirements apply. 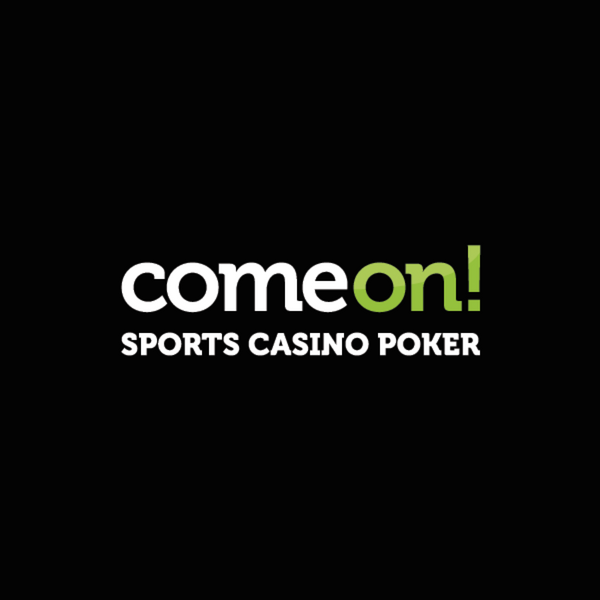 You will need to wager your bonus and deposit amount 35 x in the ComeOn Casino before you can withdraw. 5. You cannot combine Sportsbook and Casino to achieve the minimum wagering requirements. 20 Free Spins T&Cs: 1. New UK 18+ customers only. 2. 20 Free Spins on Starburst awarded to new registered customers. 3. There are no deposit requirements 4. 30 x wagering applies to any winnings from Free Spins before you can withdraw. 4. Max. payout £100. 5. Free Spins must be claimed within 7 days of registration. This offer is only open to new UK mainland customers who are 18 years or over. Once you have registered a new account, you will need to opt into this promotion, either during the registration process or by selecting the promotion in the My Bonuses when logged in or upon registration. To qualify, you will need to deposit a minimum of £10 into your account and place a £10 bet at minimum odds of 1.8 in any sportsbook market, within 14 days of opening account. NOTE: Qualifying bets do not include each way bets. You can place this bet on any market. Please note that deposits made using Skrill, Moneybookers, Neteller and Paysafe are excluded from this offer. You can read about how to place and receive a free bet here. Within 24 hours of your qualifying bet being accepted, you will receive a £10 free bet token. How can I use my free bet token? You will be able to see your free bet token in a drop-down menu on your bet slip. To use your free bet token, simply add a selection to your bet slip and select your token from the drop-down menu. Your free bet must be used within 30 days of receiving your free bet token and can be used on either single or multiple bets. Free bet tokens cannot be used in conjunction with any other offer. Please note that customers who register an account at ComeOn UK on or before 1st Aug 2016 will not qualify for this welcome offer. Your welcome offer terms and conditions can be found below. This offer is valid until 1st August 2019. You will have a total of 30 days to complete the bonus from the activation date. The date when you activated your bonus can be found on the “My Active Bonuses” page. This offer cannot be used in conjunction with any other Welcome Offer including our Sports £10 Free Bet or any Enhanced Odds promotions. Upon registration you may choose which Welcome Offer you would like; Sports or Casino. If you want to claim the remaining Casino or Sports bonus, you must deposit again. ComeOn! will double your first deposit, up to £25. The maximum bonus you can receive is £25. a. Casino: 35 x bonus and deposit amount. b.You cannot combine Sportsbook and Casino to achieve the minimum wagering requirements on this bonus. Deposits made via Skrill/Moneybookers, Neteller, Paysafecard , Webmoney and Ukash e-wallets are excluded from this offer. If you are situated in Sweden, Norway or Finland, you can watch live streaming on ComeOn! However, this is no comfort to UK or Irish customers. 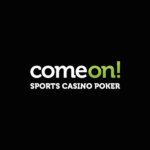 Again this is one of the best and worst things about ComeOn as it streamlines the whole betting process and removes all clutter, however, some people like to watch what they bet on. I am sure this is something that they are working on and this would add some extra value to the website. Personally, it does not bother us, as we like to get our bets on quick, and then carry on with the rest of our lives, or simply watch the event on TV. This is where we really think ComeOn! have excelled. The design is one of the “cooler” designs we have seen in a long time. We do not like to throw around the word “cool” too often, but this is when it simply makes sense to do so. Their brand colours, font and background images set the scene nicely for a pleasant betting experience. The sportsbook is basic but does exactly what it needs to do. My only gripe is that there is no quick find icon for horse racing. However, you can easily find it on the left-hand sidebar. The withdrawal speeds fall in line with the average withdrawal speeds of all igaming companies. ComeOn! is one of the only igaming companies we know that has staff numbers of greater than 400, that do not offer customer support via telephone. This either means two things. 1) Their product and processes are perfected that they do not receive many requests or complaints 2) They do not like to talk to people! Thankfully, it seems like it is point 1 above. We tested out their live chat service and we were answered within 4 mins on a busy Sunday afternoon during the premier league football matches. The support agents were knowledgeable and respectful. They also offer email support as well as live chat, and while it may seem strange not to have phone support, we think this may be the way forward. Who likes waiting around on the phone, when you can go about your work and have the live chat open in the background of your computer or smartphone. This is where we really like ComeOn!’s offering. They offer a fantastic rewards program, called the ComeOn! Shop. For every action you take on the website, you earn points. 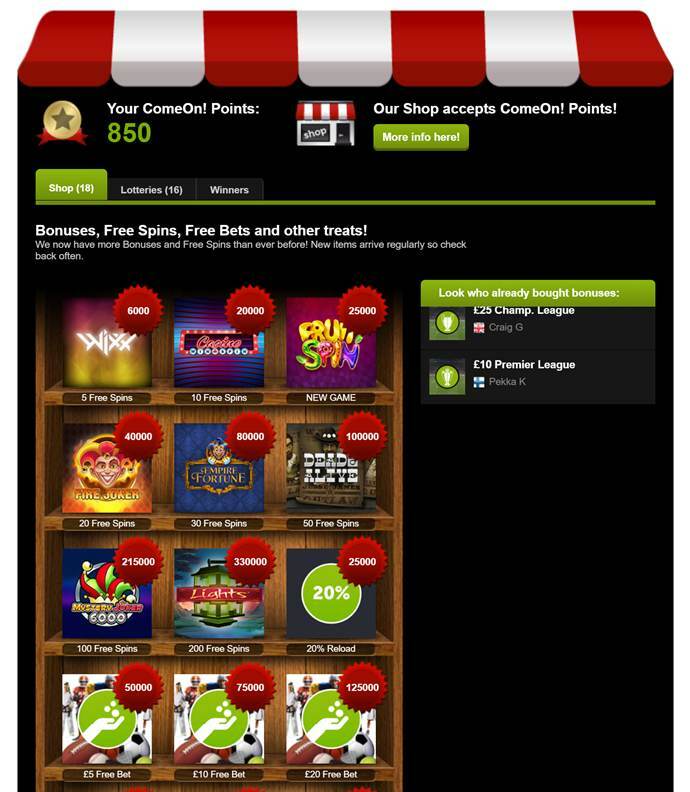 Points can then be redeemed for prizes, such as free spins, free bets or big reload bonuses. As you can see below, while reviewing the site, we already built up 850 points just by signing up and logging in a few times. The more active you are on the site, the more points you can earn and then exchange for free bets. I wish all sportsbooks offered something like this. Instead of having to wait for a company’s bonus manager to issue you a bonus once every 6 months, you can at least how much more points you need before your next free bet is due. Join the club and get up to a £25 Free Bet every week. All you need to do is opt-in and place combo bets with min odds 2/1 to rise up through the various levels, for a scrumptious Free Bet every week. We like ComeOn! as its a clean and user-friendly interface. It is fast to load and to place a bet. It covers all your favourite sports and includes live betting as well as regular betting. If you like casino games, you also have a host of game options to choose from. We especially like their points reward system and think all sportsbooks should introduce something similar. First time on a gambling site and encountered an issue that I couldn't work out so contacted them through Facebook messenger. Very fast reply and after a short exchange of messages, Dave had sorted it out for me! Excellent support and looking forward to some bets coming in :-) thank you Dave! I have been using this site for years now, but more recently they have upped their game with very frequent offers which make your betting more enjoyable. I have never had an issue with withdrawals always had my money back within a few days. Would highly recommend.